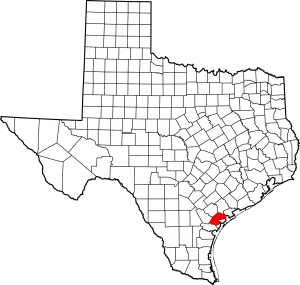 I was the guest of Refugio and Refugio County on June 22, 2015. 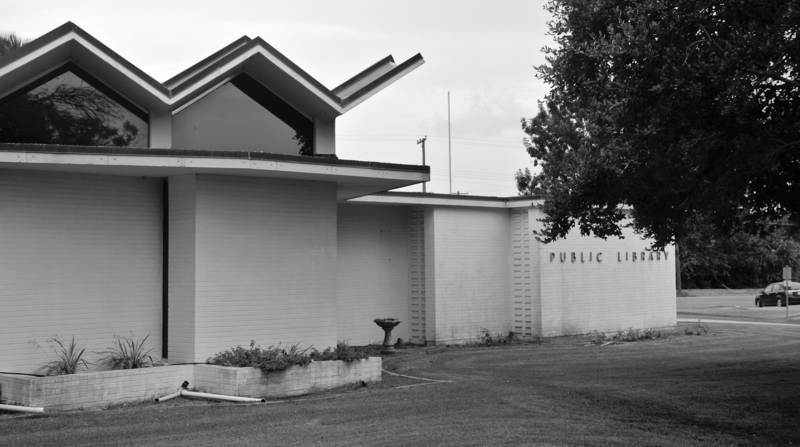 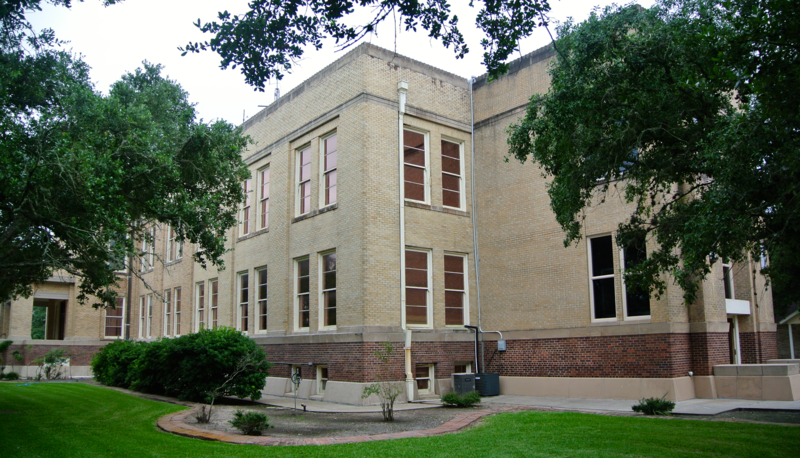 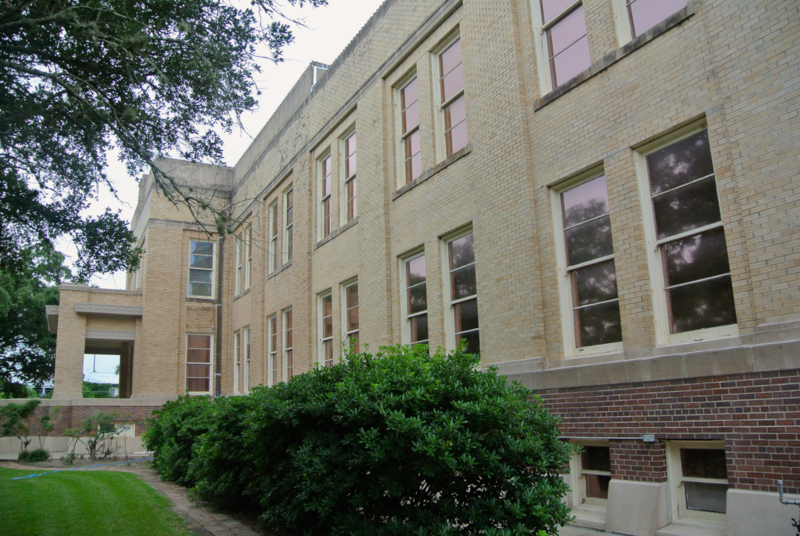 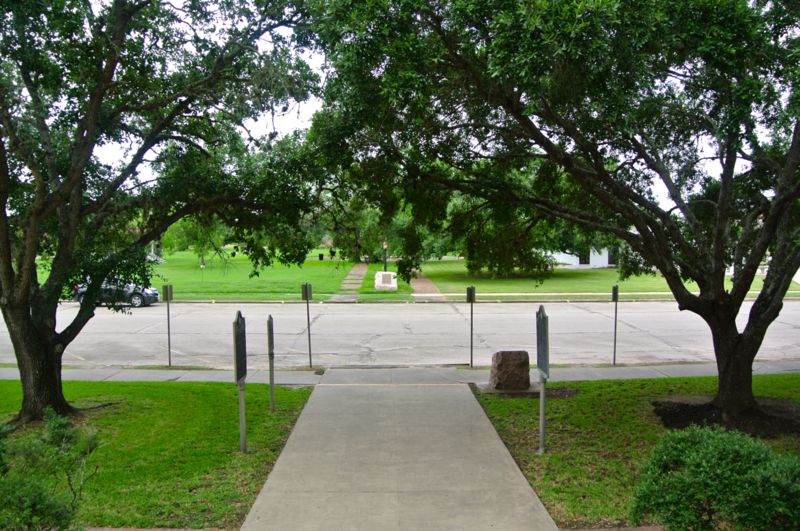 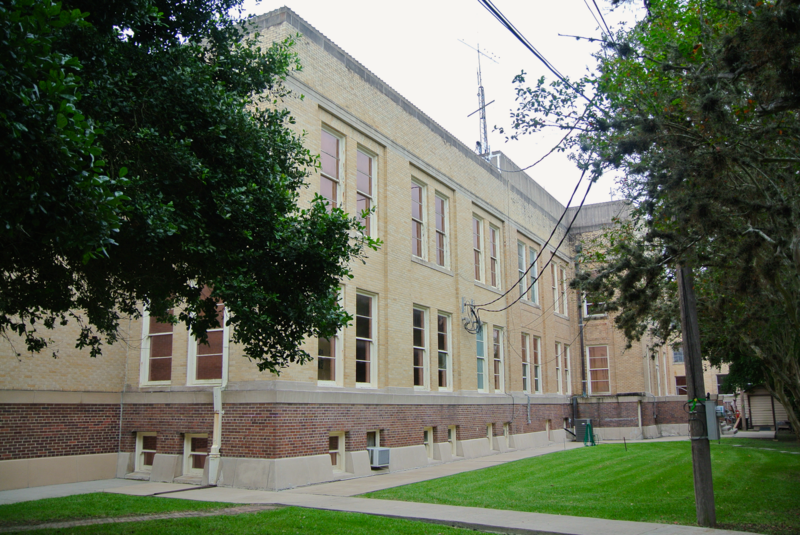 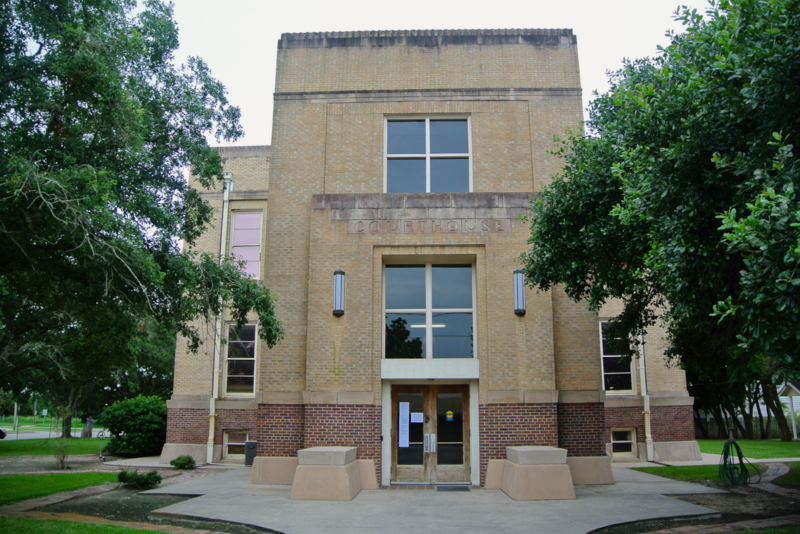 Refugio County’s had its fair share of courthouses through history. 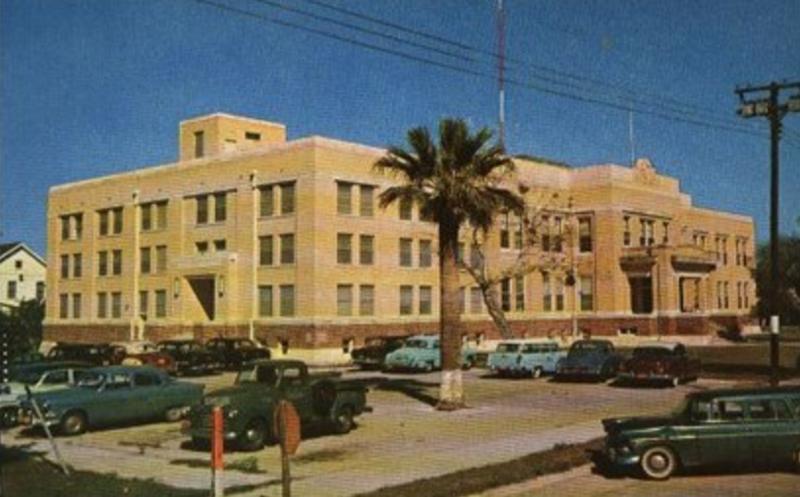 Some of its more interesting stories include the use of the crumbling Refugio Mission at different times from 1837 to 1848, and how county employees are said to have torched the 1880 building when commissioners refused to build a new and more spacious one. 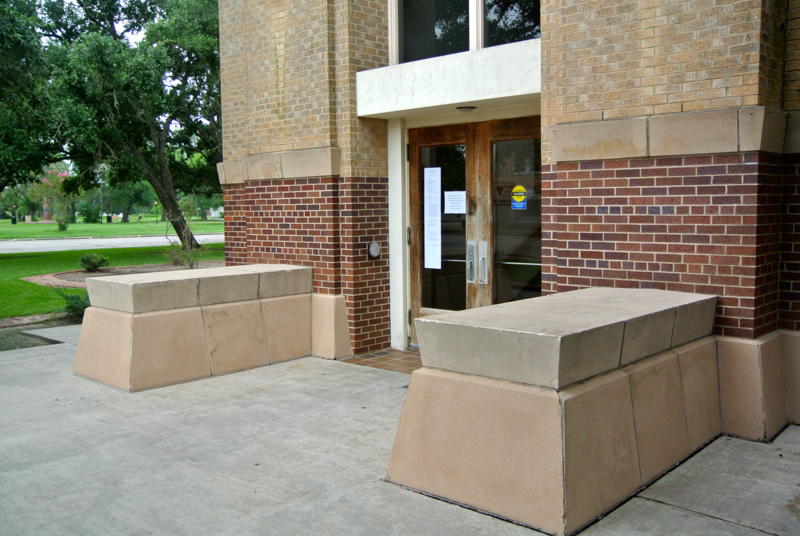 Unfortunately, no pictures of these structures remain. 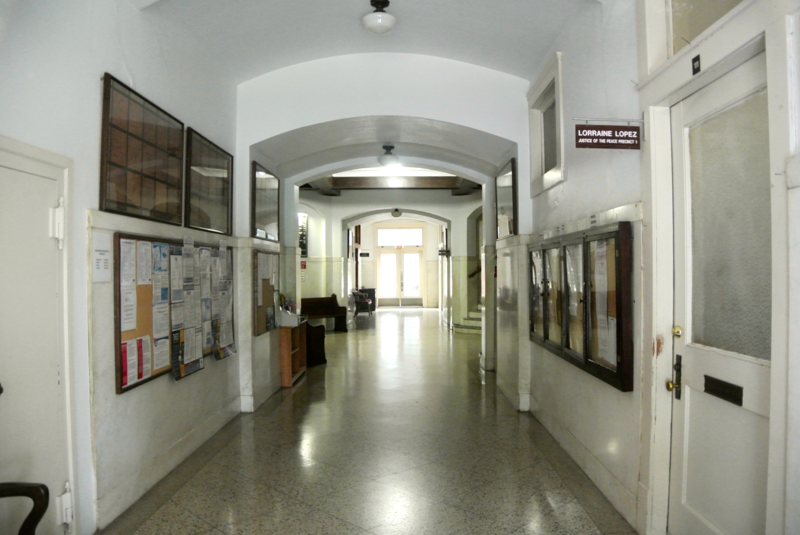 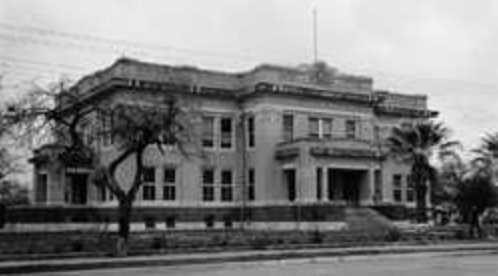 As for the 1917/’19 courthouse (reports on the year of completion differ), this blurry TxDOT image is all we have. 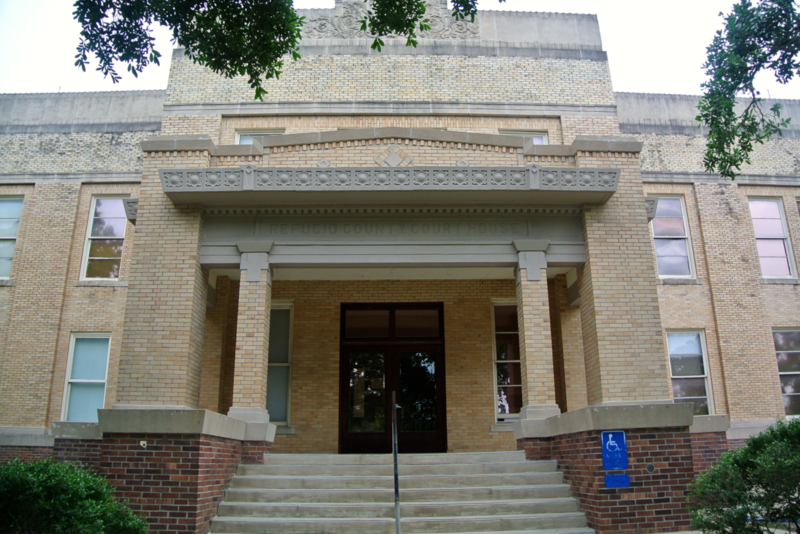 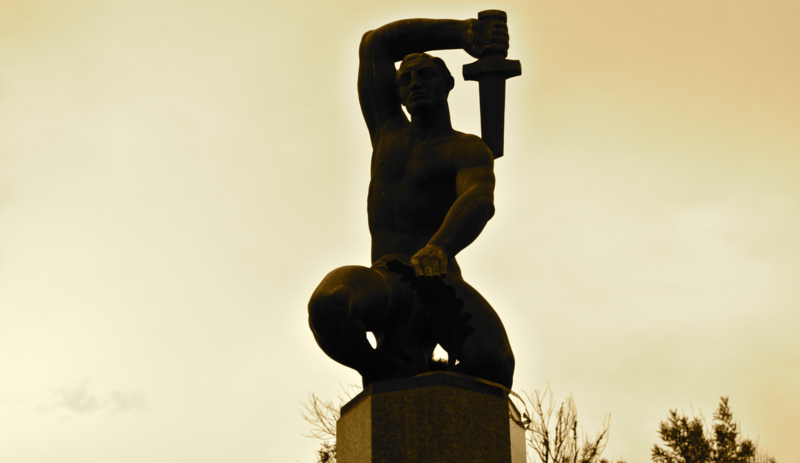 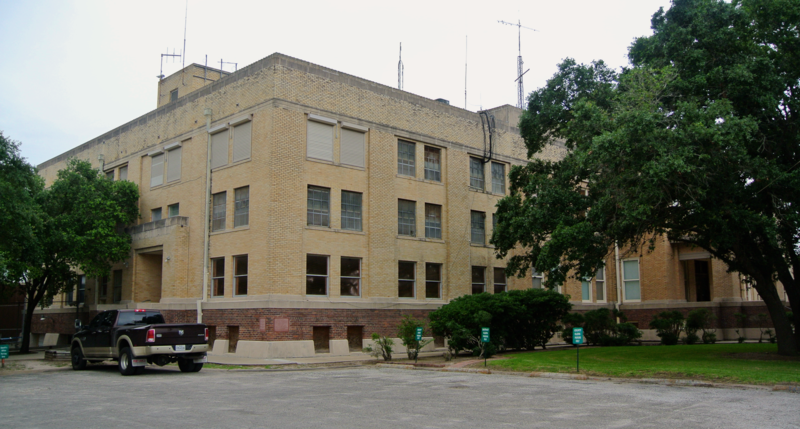 It was designed by the popular South Texas architect Atlee B. Ayres, who would have drafted its plans shortly after leaving the position of State Architect. 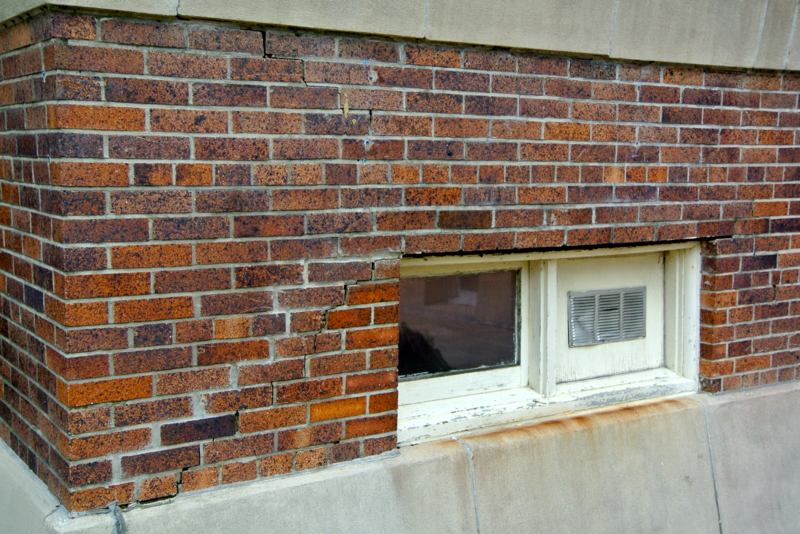 Local contractor W.H. 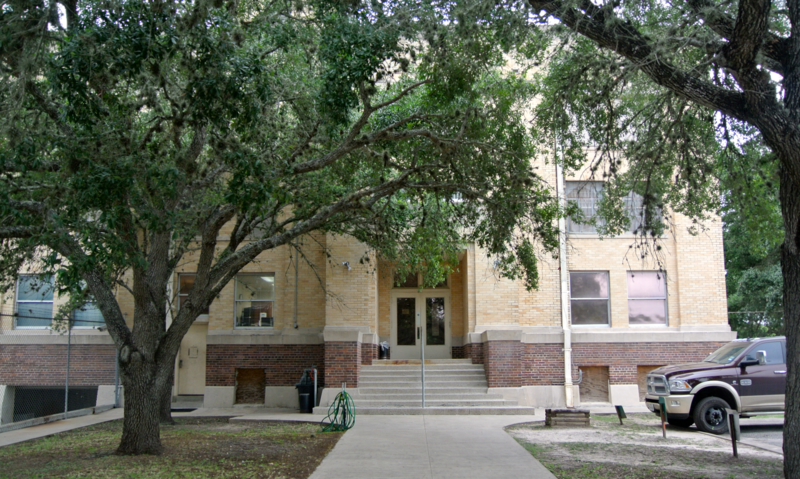 Borglud provided its construction. 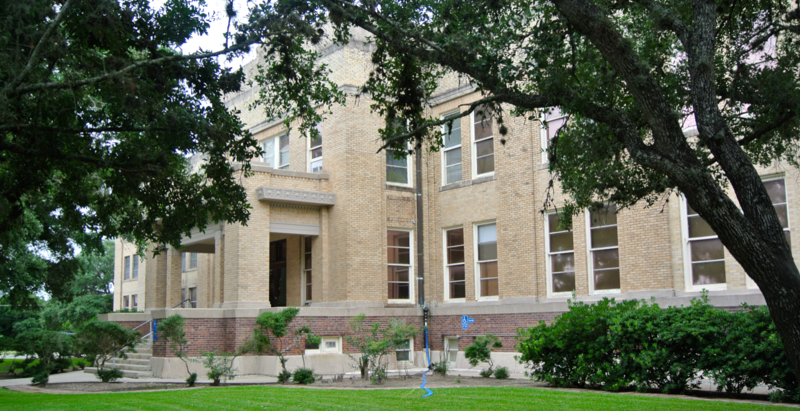 The Mission-Style influences are pronounced (a common denominator in most all of South Texas’ courthouses, especially those designed by Ayres). 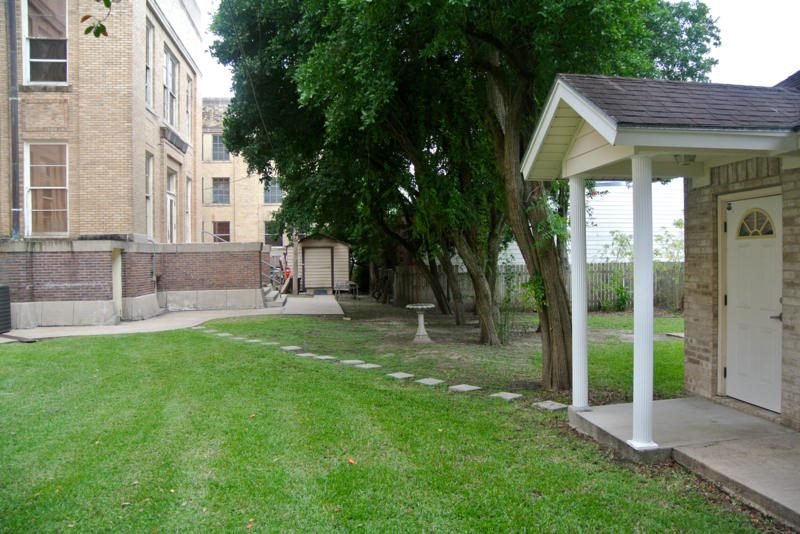 To me, this one looks like a “mash-up” of his creations in Jim Wells and Kleberg Counties, minus a dome. 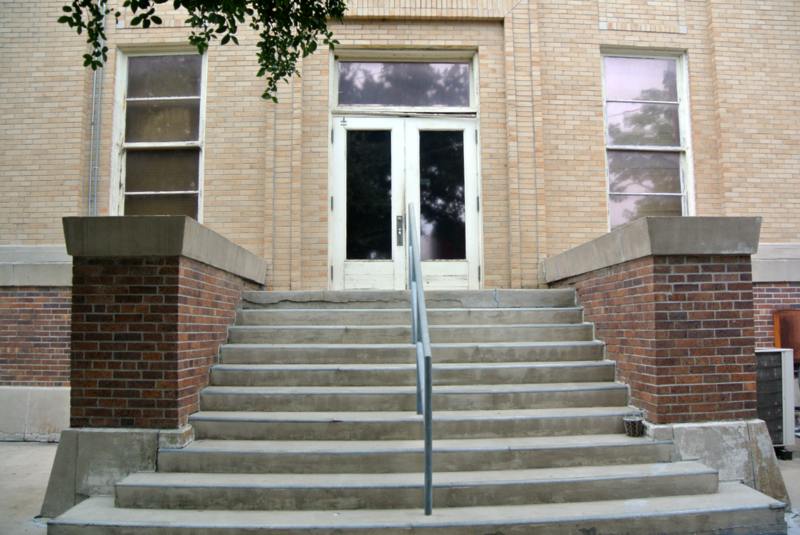 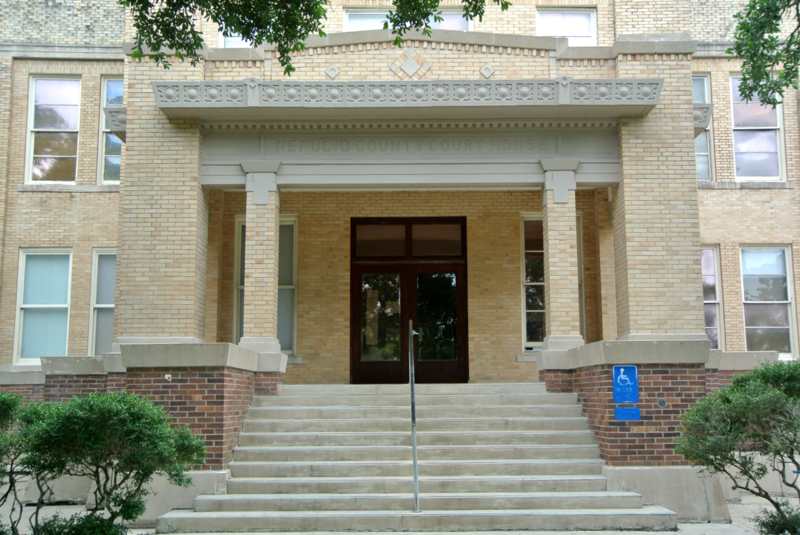 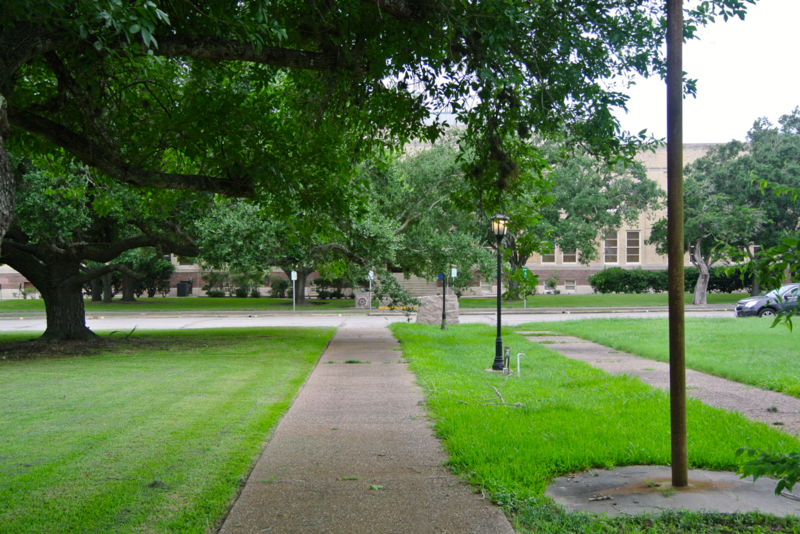 The front, heavily shaded entrance is on Commerce Street, facing east. 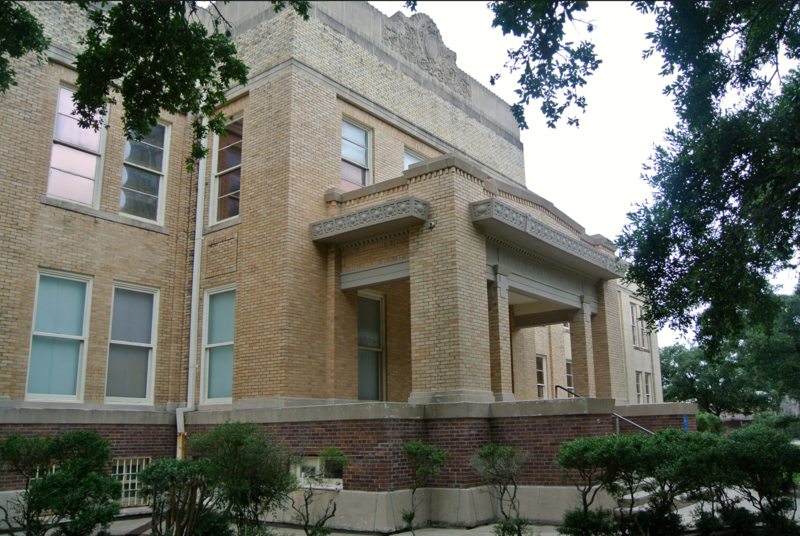 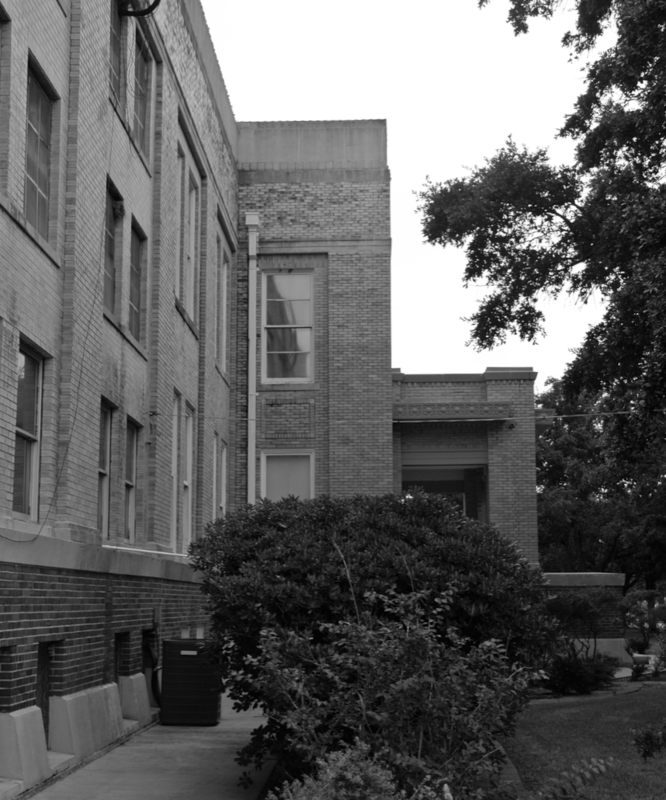 The cornerstone only pertains to the 1950 addition, not the original courthouse. 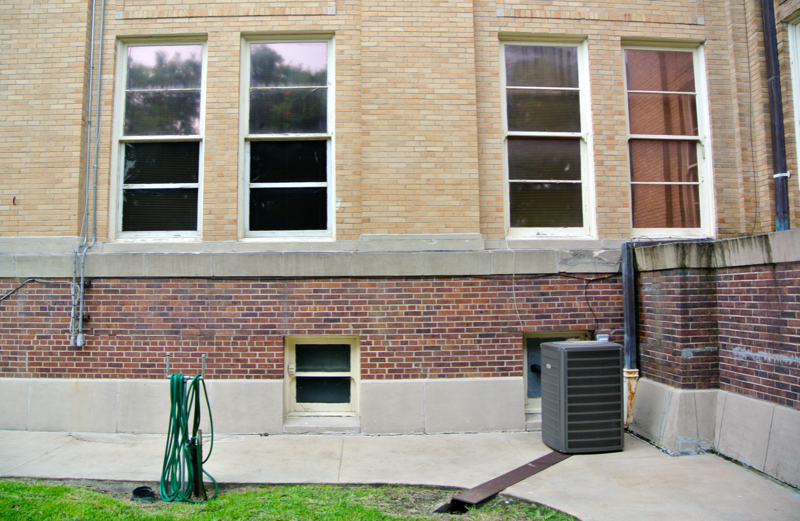 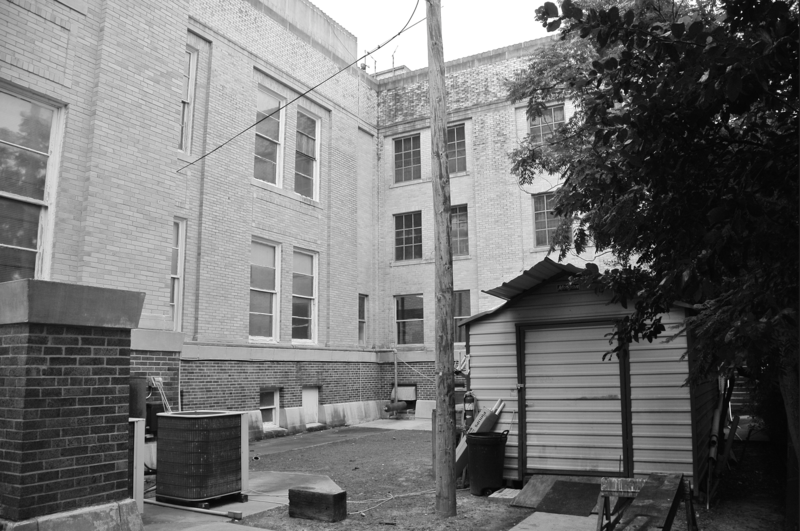 The rear of the courthouse is fairly secluded. 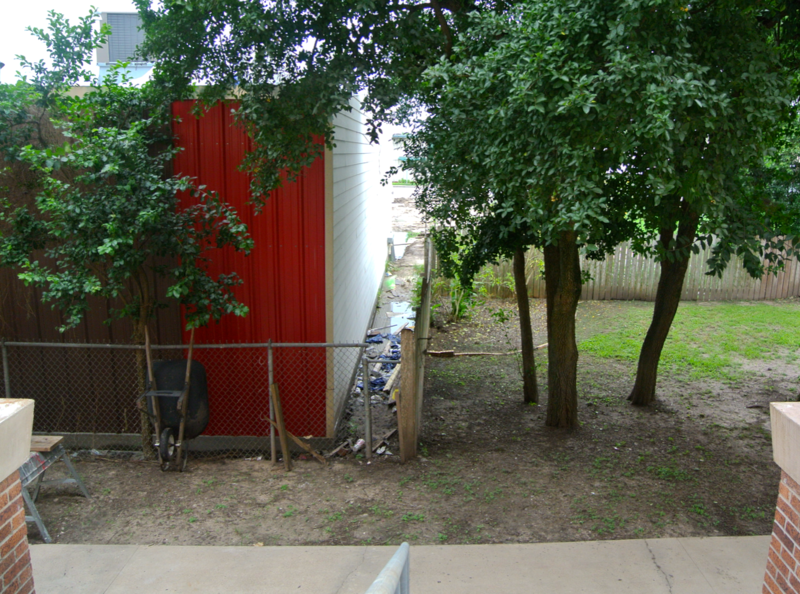 Out of all the sides, this one is in the worst shape. 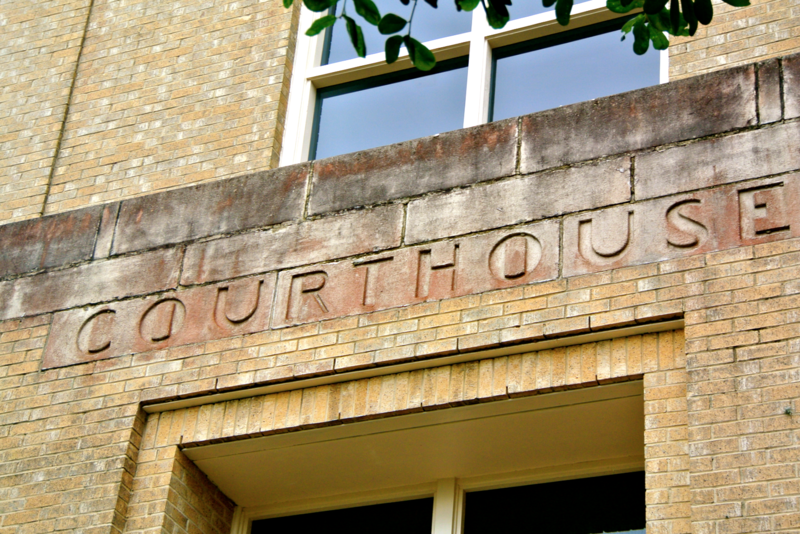 Yet while some of the building shows serious signs of wear and tear, this courthouse does have some very nice ornamentation. South Texas mosquitoes are killer in the summer (sometimes literally). 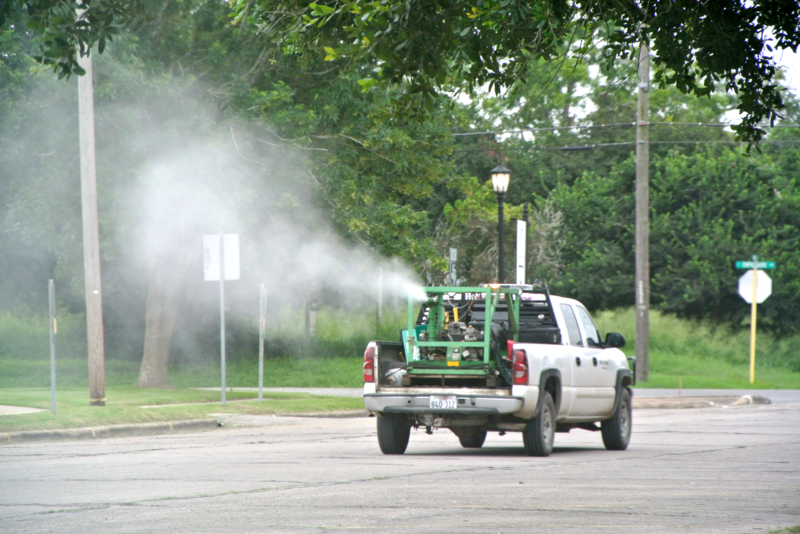 I noticed a truck rolling by the courthouse while I was there, spraying pesticides. 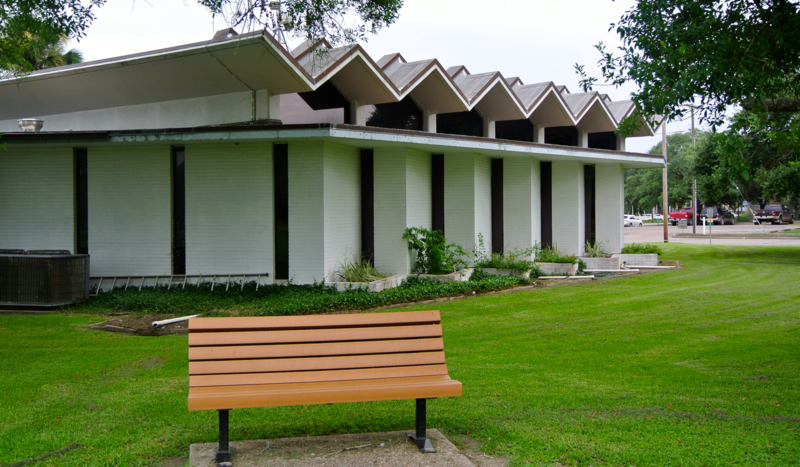 The Dennis M. O’Connor Public Library’s got a psychedelic roof. 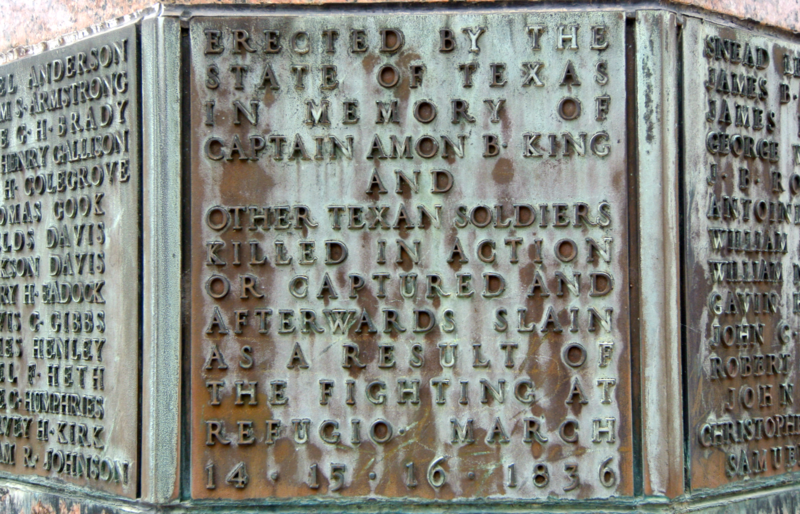 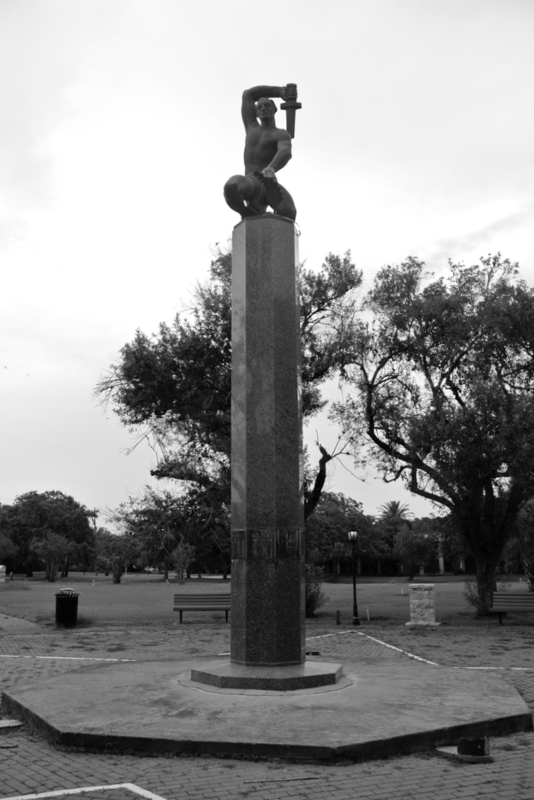 A memorial to the Texas Independence soldiers that fought in the Battle of Refugio is across Commerce Street from the courthouse.